Drop in for coffee and conversation! Wednesday, Dec. 6, 7:30–8:30 a.m.
Let’s chat! 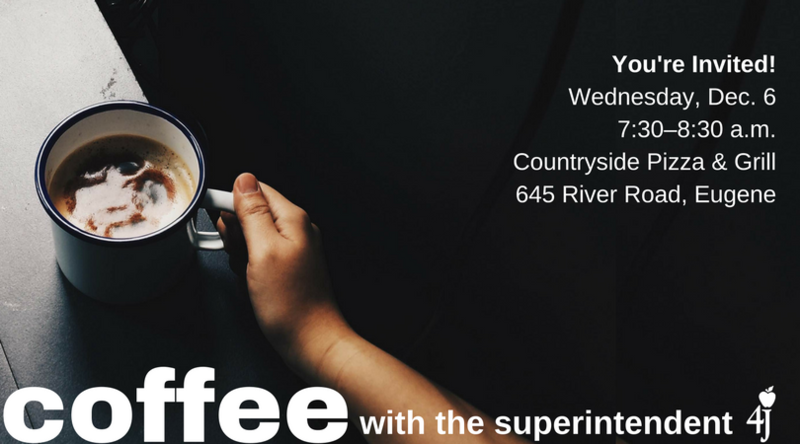 You’re invited to drop in for a cup of coffee, fresh biscuits and conversation with Eugene School District 4J Superintendent Dr. Gustavo Balderas. The treats are on us! This is an informal time for parents, students, staff and other community members to meet the superintendent, learn about important things happening in the district, ask questions and share your ideas and feedback. This is the second in a series of drop-in events that will be held throughout the school year. Later meetings will be held at different locations around the district. Times will vary between mornings, afternoons and evenings to accommodate differing schedules. The next coffee talk will be on Wednesday, January 24, 5:30–6:30 p.m. (change from original date). Whether you have a specific question or idea, or simply want to hear more about the district’s biggest priorities, challenges and successes, please join us for coffee.